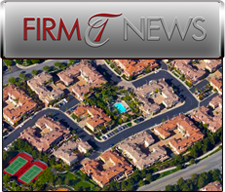 We are proud to announce that the Aventura Homeowners Association has selected Tinnelly Law Group as its legal counsel. Located in the City of Irvine, California, the Aventura condominium project consists of 167 beautiful condominiums built by California Pacific Homes. Its residents enjoy fantastic amenities such as a community pool, spa and tennis courts. Aventura is located close to shopping, theatre, schools, parks and the Irvine business district. Our HOA attorneys and staff look forward to working with Aventura’s Board of Directors and to developing another lasting relationship with a Homeowners Association client.